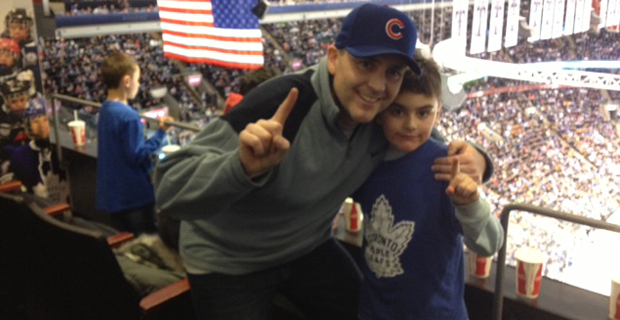 Coaching is all about creating memories, such as Mike Toth and his East York Penguins taking in a Maple Leafs game earlier this season. Valentine's Day was on the menu last week and my son's grade one class celebrated with a special field trip to the local outdoor rink for some public skating. I'm not sure who Theo's "little sweetie" is, but I do know he already has an eye for the ladies and it was hilarious watching him race around the ice showing off for the little gals in his class. Now, if I could just get him to skate that hard in his Tyke games. But as we watched our kids having a great time together, their teacher made a very accurate observation. "When the year is over, the kids won't remember all the spelling tests I gave them," said "Mrs. T". "But they'll definitely remember special days like this." A big part of teaching, and coaching, is creating memories for the children under your care. During my season coaching the eight-year-old East York Novice Penguins, I've come to understand that wins and losses aren't the most important thing to kids at this age. Sure, everybody likes to win and we've definitely won our share of games this season. But, to be honest, the spirit in our dressing room is exactly the same regardless of whether we won or lost. One of the big reasons? A "Penguins post-game party" that sees the coaches hand out hockey cards to the top "hustler" of the game, and to the guy who made the best pass of the day. It's not a cheap tradition, as hockey cards are a lot more expensive than when we grew up collecting them—and they don't even include those puck-hard sticks of bubble gum any more, for crying out loud! But the investment is well worth it, as our players love competing for the cards and it's a great way to celebrate in the dressing room, win or lose, following the game. Earlier this season, we were lucky enough to take our entire Penguins squad to a Toronto Maple Leafs Game at the Air Canada Centre—a trip I told you about in a previous blog. Just last week, meanwhile, we also staged a special event at one of our practices, "The Penguin Olympics". In the spirit of Sochi, we split our guys into two groups representing Canada and Russia and pitted them against each other in a series of Olympic-style events (speed skating, slalom puck relay, etc. ), culminating with a gold medal ball hockey game. In the end, Russia won the overall medal competition while Canada took a 7-6 nail biter in the hockey game, so everybody was a winner. But instead of grabbing a medal, our guys got a chance to grab into a bag full of chocolate bars, with the host Russians getting first dibs. Depending on how we do in the playoffs, our season could be over in two weeks. But even it does wrap-up a little too early, at least we'll have some great mental snapshots from a special season, regardless of whether we win a championship trophy. Yes, teaching, and coaching, really is about creating memories. Come to think of it, maybe I should borrow from my son's teacher and invite a few eight-year-old girls to our next Penguins practice. Then I bet we'd really see our guys compete for that "hustle" award, right?